You are invited to join a discussion on public urban space. 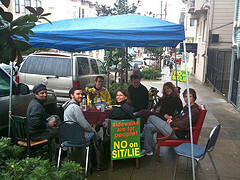 Please join the Nonsite Collective at SF Camerawork on Saturday, March 26, 2011, at 1pm, for a public discussion among artists, writers, organizers with the Sidewalks Are for People campaign, and others. We’ll be considering questions of urban common space and the spatial commons — its production, the political struggles taking it as both arena and stake, its use, and the powers and counterpowers that occupy it. Writers, artists and culture workers collaborating in Nonsite’s Common/Ground project will use the discussion as a point of entry and a source of “action scripts” for our own investigations of urban public space encompassing questions of the role of artists and writers in “right-to-the-city” campaigns, the generation and enactment of ongoing responses and forms of lived critique aimed at San Francisco’s Sit/Lie law and other juridical, economic, and customary attempts to enclose public or common space, and considerations of the structuring role of spatial politics in the landscape of arts practice. Attendees are invited to develop proposals for action scripts, and to join the Common/Ground group in further public-space actions. Common/Ground is part of the Nonsite Collective’s residency, Common/Use, part of SF Camerawork’s spring exhibition, As Yet Untitled: Artists and Writers in Collaboration.